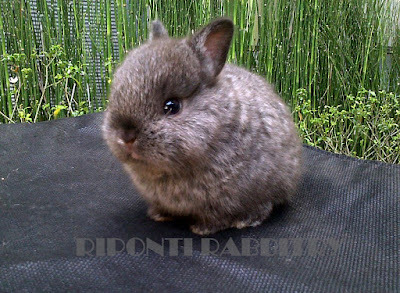 Type Netherland Dwarf Rabbit is not controlled by monogenes the same way most of the rabbit colour genes are. Type is subject to a series of modifiers that are intereacting - if you track a body type statistically, you will find that the body type of kits within your litters (you need at least 100 or more for statistics) then it conforms to a bell-shaped curve with a high medium and two small tails at each end. The trick with type characteristics is to chart the trend in your own bloodlines and then work to shift the medium of those normal distributions in the direction that you want such that the largest possible number of kits conform to standards for that trait. Anyone can select for ONE trait and shift the normal distibution left or right but often this is at the expense of another or more than one trait. Hence a balanced breeding scheme is needed where you shift as many body traits as you can together - a slow and often frustrating process but can be done. Intense inbreeding - especially if your founders are excellent show type and breed compatible type kits - is the quickest way but has very high risks of it all going wrong unless you have a great deal of understanding of genetics. Line breeding is necessary to fix in desiredtraits but on a more moderate scale than say brother-sister matings. This helps fix in desired traits but not so fast that you cannot eliminate undesired traits that might appear as recessives. Because it is a hard thing to get your head around for the average person, most breeders tend to ignore this pathway.